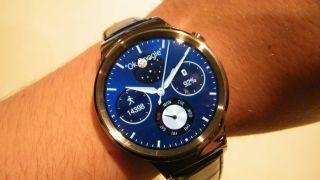 Huawei entered the smartwatch game back at Mobile World Congress in March - or at least it announced its intention to. One of the main highlights of the Chinese manufacturer's press conference was the announcement of the Huawei Watch, but the caveat was that it wouldn't be coming soon. However, one of Huawei's US sites now states, "It's right around the corner" with a picture of the Huawei Watch right next to it. You can throw your email address into the box on the site to get updates on when it'll be coming. The wearable has already passed FCC certification so it's likely the watch is launching very soon. As for the rest of the world, we don't know exactly when it'll be launching. We've put our feelers out to try and find out when the watch is landing.